Evaluate recent and predicted fees and tuition charges for Bluefield College, as well as how these prices compare to the U.S. average. Learn how tuition and fees at Bluefield College match up to the average and discover what you can do to effectively plan for potential tuition increases. For nationwide, regional and statewide comparisons, view the table below to see how Bluefield College measures up to other schools. How Much Will Tuition & Fees Be for Bluefield College? Full-time undergraduate students at Bluefield College paid $24,800 in tuition and fees for the 2017 - 2018 school year, prior to modifications for financial aid. Of that number, the expense of tuition came to $24,040. The remaining $760 represents additional fees. In contrast to public colleges, Bluefield College does not provide reduced tuition and fees to residents of the state. Fees and tuition costs quoted on this page do not include room and board, which will increase your costs. However, a lot of students will end up paying below full tuition because they qualify for financial aid as well as other reductions. The next table outlines the costs defined above for the 2017 - 2018 academic year. For more information, click Bluefield College Part Time Tuition & Fees. There has been a growth of 2.0% in Bluefield College tuition and fees for out-of-state students in the past 5 years. Tuition expanded by 2.0% and fees expanded by 0.0%. This year, undergrads should anticipate paying $25,298 if the growth keeps up. Due to price increases, the full cost of a four-year degree from Bluefield College will be $104,286, and the full price of a two-year degree would be $51,105, which doesn't include additional charges for books, transportation, and room and board. 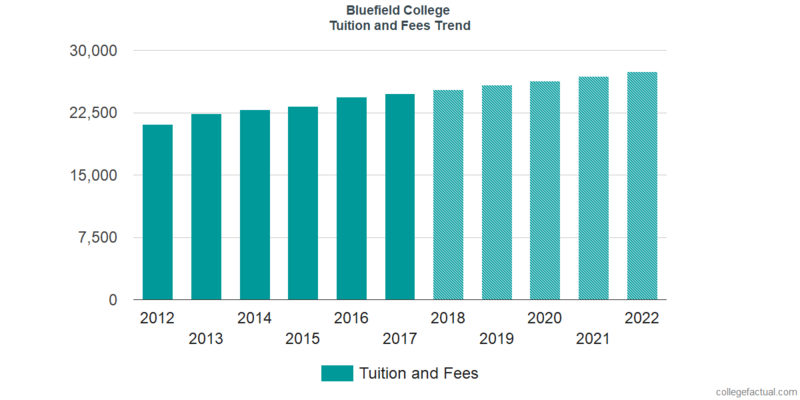 See this next chart to find out how Bluefield College tuition and fees may increase in the future. Be aware of how much college fees and tuition is rising every year. At most schools students will end up spending more money on their final year of college than they did for their first.